The pigeons and ravens brought back news from afar all about good tidings from this recently established posh eatery namely Otel Lobby. It wasn’t mere curiosity that brought me there but most of all, to honor a courtesy invitation from my friend Mr. Erza Setyadharma, the gourmet aficionado of Jakarta. Located inside the integrated complex of Bakrie Tower and the shopping mall of Epicentrum Walk, it was not an easy task for me who just blindly parked the car in the basement lot of the latter establishment. After a long, contemplative walk with a little bit of splash here and there due to the rain, finally I found the place and entered it gracefully under the cover of night to shade my mildly drenched jeans and shoes. What brought my mood back was my encounter with fellow food bloggers, which I would address here in their famous pseudonyms. JenzCorner, Wanderbites, @ImelB, GFGFGL, and one who actually has the talent but still not yet laying his foundation in blogging life, @danieldeka. And of course, the prominent players of Jakarta’s gourmet lifestyle duo, Mr. Erza and Mr. Ve Handojo were also there. That night, we were also accompanied by Ms. Maya Aldy, the engineer behind the success, also acts as Otel Lobby’s head chef, and the co-owner of the establishment with Ms. Gaby Bakrie. 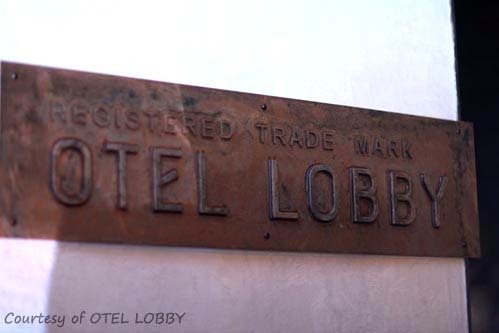 The word Otel Lobby is pretty much derived from what a hotel look like. You would recognize right away as soon as you enter the lobby area. 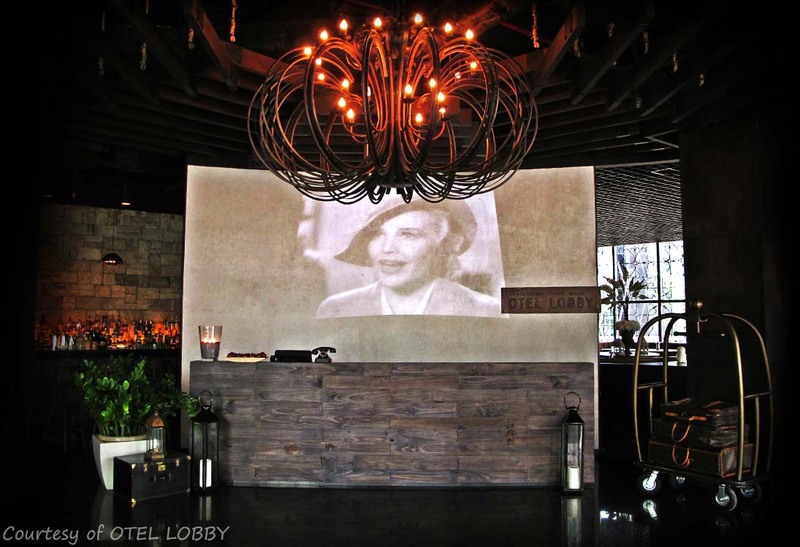 The style is a dark touch of luxury, huge chandelier, and a humongous screen filming flicks from black-and-white era. Not forgetting, they also tuck a trolley to add more hotel-ish touch. The dining tables are encircled with cushions thus making it feel personal yet suitable for groups. The ambiance was also conversational and accompanied by lounge music or late night chill out R&B music. 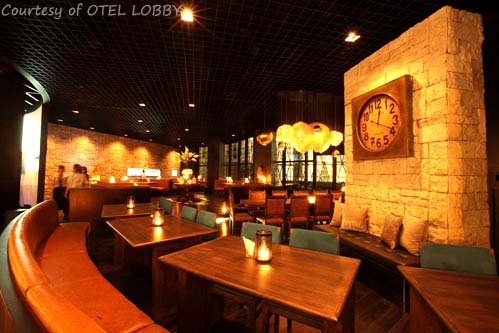 In short, Otel Lobby is a gastropub although the term is already obsolete nowadays. But let us not get caught with such facade first and pick either the left side for all your liquor needs or like us, the right side to astonish your palate. If you think that you have traveled the whole world for good things, then Otel Lobby must come next in your encyclopedia of gastronomy. Thy will know why from this story. After seated properly, we were given the chance to take a sip on their famous cocktails and mocktails, tailored personally by the award-winning mixologist, Mr. Benjamin Browning. Meanwhile the kitchen is commanded by the eccentric Mr. Raj, a Pinoy-American clad in AC Milan shirt, shorts, tattoos, and an apron. Can’t help but to feel intrigued thinking about what he had in his sleeves for us that night! So, the first circle of heaven served was a plate of diced tuna crudo with beetroots cooked in three ways, attired with balsamic reduction and bawang goreng! A different approach that came from each uniquely cooked beetroot paired with the tuna was just exotic. 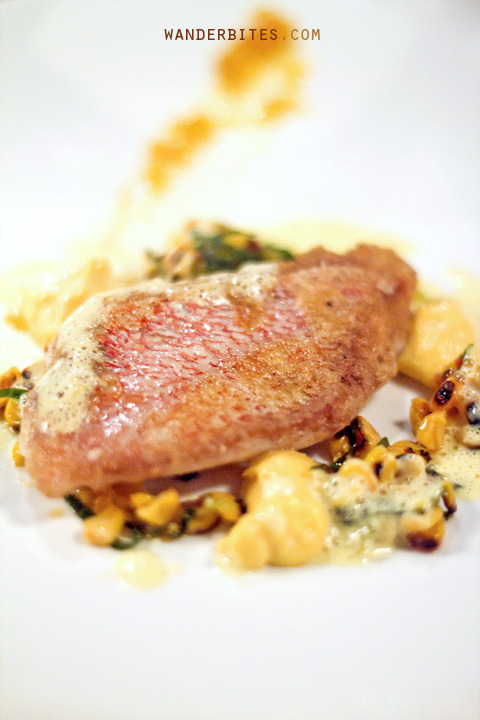 The dish had different textures, different angles, yet sweet and sublime. The balsamic reduction brought the sour-y fresh approach but the most bizarre one, in a good way, came from the fried shallots. 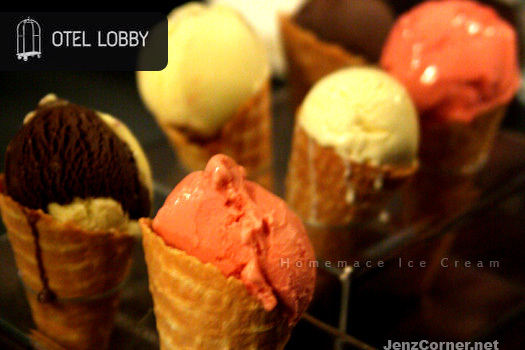 If the first one sounds healthy then it’s a mistake to assume that Otel Lobby is there only for your meager calorie intake. 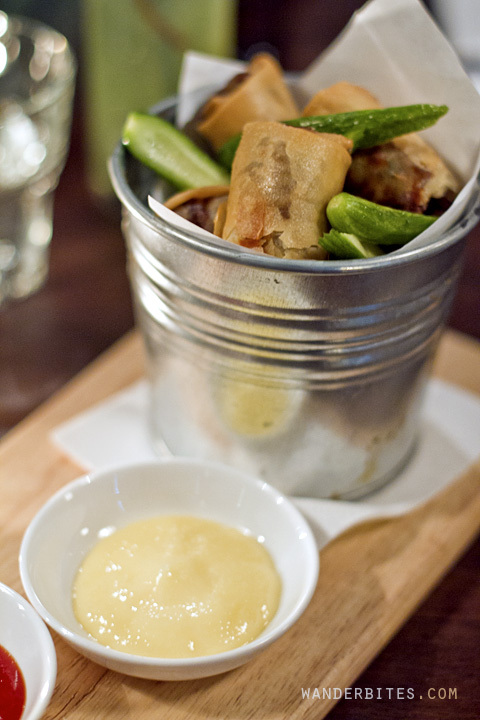 Because then came buckets filled with spring rolls, loaded not with mere vegetables but diced wagyu and cheese sauce. A savory start that matches my personality and preference really boosted my morale and anticipation! Not forgetting the Indonesian palate that cannot just simply eat spring rolls plainly, Mr. Raj prepared also chili sauce altogether with pickled cucumbers to refresh our aftertaste. Surely not stopping there, we were presented with mini duck buns. 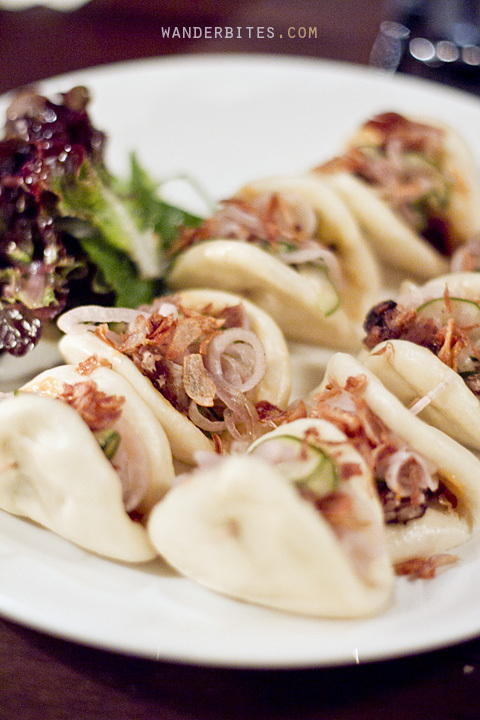 Made thick but tender, the bun simply wraps the duck with again another local touch of onions and fried shallots. A good bite size bar food to get along with your friends. One probably enough for each one of us but make no mistake again, it was not. Some were lucky to get away with two of those delicacy. We can tell from Mr. Raj eclectic looks that he’s a kind of chef that ‘should’ love doing experiments here and there with food. The Asiatic style is certainly his main influence, but his selection of ingredients and the way he presents his dishes appeared to be the most daring and adventurous part of all. For instance, instead of the pasta we know, he chose a rather ‘reckless’ one but beautifully made. Just give it a cut here and there to your heart’s content, and there’s the malfatti or some say, maltagliati. 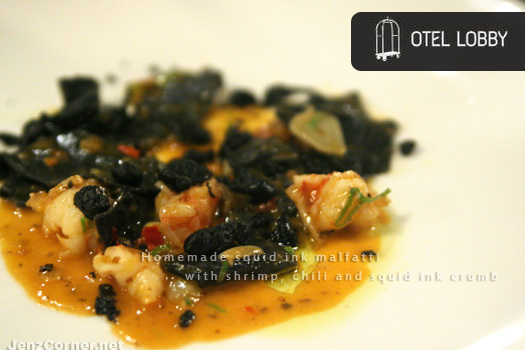 Colored jet black using squid ink combined with the generous portion of the shrimps, a hint of spiciness from the chili, and playful texture from the crumbs yet the mildly savory sauce command you not to add anything more to the dish! It’s good just the way it is! The song from the seven seas continues with a well cooked pan-roasted red snapper substituting the salmon. The sidekicks however were quite strange again. Mr. Raj cooked corns in three way and using marmalade as the sauce. In terms on how it looks, well it’s very daring indeed but certainly very rustic. But then again Mr Raj ‘toyed’ us again with the texture and that makes every dishes he made so far was fun. Though personally I prefer something more sour to freshen up a bit after having all those sweetness from the corn. The main dish ended with the energetic yet enigmatic braised short ribs with Mr Raj self-styled Korean fried rice. First of all, it’s not exactly Korean fried rice like we’d all describe. Mr Raj told us a bit about his version, that instead of rice he uses smashed rengginang or rice crispies, then he uses oyster tempura, and lastly kimchi to add the Korean flavor. The weirdest part came from poached egg and there he specifically instructed all of us to mix them all up! 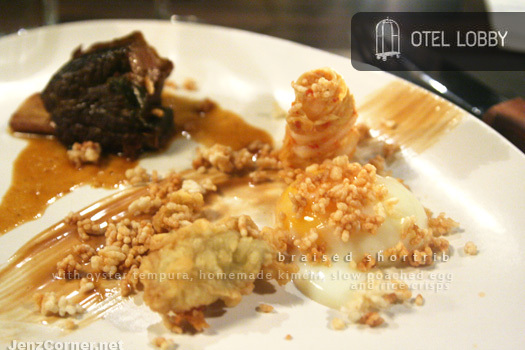 The beef itself was very tender and succulent but most of all, it tasted like semur daging! How nostalgic and the kimchi really toned up the flavor of the sidekicks. Apart from the ‘messy’ looks, I believe that it’s the way Mr Raj wanted to show his aesthetics. Make it outrageous but make it beautifully delicious! The sins continued with variety of homemade ice cream on cones. What a way to end the terrific night instead of boring cakes or pudding. It was an honor to be served with such hospitality from Otel Lobby especially Ms Maya and Mr Raj. Their visions of utilizing local, quality ingredients proved to be very successful and thus making Otel Lobby serves out-of-this-world dishes at a very affordable price. Last but not least, I extend my thanks to Mr Erza, Mr Ve, and all the food bloggers. We shared the same dishes, we share the ice cream, and we had our fun. The culinary world is ours for the taking and a return here is a must indeed! Atmosphere: Feels like a hotel lobby with its signature trolley and the rest feels like exclusive restaurant in the afternoon and a cool lounge at night. 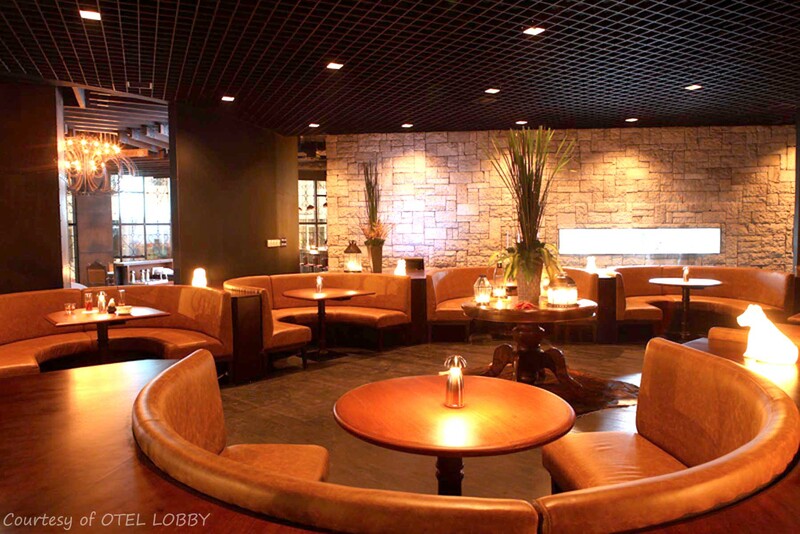 Ambiance: Conversational, lounge music, and at night DJ plays smooth RnB. Service: Good initiatives and knowledgeable. Definitely, I’ll give it a try someday!